Are you thinking to start a blog? A reliable and easy-to-use blogging platform can make your work easier. It eliminates the need to know complicated HTML coding and gives you the tools to make a distinct blog that will not only get noticed but also make you money. Also, you don’t need to be an expert to maintain your blog site, you just need to produce quality content and the rest is taken care by the blog software. While there is numerous blog software available, below we will take a look at 10 of the best blog software to help you make the best decision. WordPress is one of the most popular and free blog software powering more than 25% of all websites on the internet. It requires no coding knowledge and offers extreme customization possibilities. It is a good choice for people who want to upgrade to a self-hosted WordPress blog in future. Professional Themes – You can choose from hundreds of customizable and responsive themes that look great on any device. Intuitive Editor – The fast and intuitive editor save your work draft every few seconds. Drag and Drop Options – Drag and drop images into pages or posts, embed audio, video and more. Apps – Mobile and desktop apps for Android, iOs, Mac, Windows and Linux to update your site from anywhere. Export Content – You can export your content anytime. Social Sharing – It allows you to automatically send your new posts to your social media accounts like Facebook, Twitter and more. In-depth Stats – Get in-depth stats of your visitors. Know what they read, where they are from when they visit etc. SEO – Built-in SEO helps your fans to easily find you.  Customer Support – Get 24/7 support via email, live chat, and community forums. Free for life – It’s free to make your site at WordPress, you have to enter your blog’s desired account name with WordPress.com subdomain. You can create a custom one later. Pricing – Anytime you can upgrade to a paid plan, starting at $2.99 per month. It provides a live preview of your post while you are writing it, so you can see and correct any writing, formatting or coding mistakes as you go along. Live Preview – The split-editor screen, with a live preview on the right and Markdown syntax on the left, allows you to type as well as format your writing on the fly. Multi-user – A multi-user blog to invite and allow your team members to write about the areas they specialize in. Easy Browsing – Stay in total control of your workflow through quick and easy browsing of your content. SEO and social sharing – It supports SEO and has built-in social sharing, without any extra plugins and extensions. Fast – It is powered by a modern technology stack using Node.js which makes it really fast. Free Trial – You can try it free and unlimited for 14 days without any obligations or requiring any credit card. Pricing – The pricing plan starts at $19/month for up to 25000 visitors. 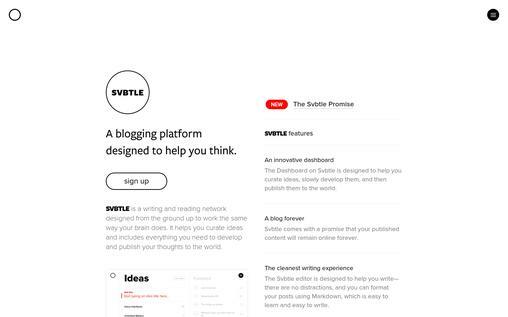 Svbtle is one of the simplest blogging platforms with sleek and interface. It is ideal for beginning bloggers or writers who want an online presence without having to deal with SEO, design, blogging software or anything besides the writing. Easy to Use – Anyone can use it without any technical blogging knowledge trouble. WYSIWYG – There is no need for any HTML and CSS knowledge as everything is WYSIWYG, making it very beginner friendly. Ideas Page – In this page, you can dump all your ideas, thoughts, links or whatever tickles your creativity. Google Analytics – It is easy to incorporate Google Analytics, you just need to type an analytics code number. Cleanest Writing Experience – The editor is designed to help you write without any distraction and you can do formatting of your posts using Markdown, a text to HTML conversion tool for web writers which is easy to learn and write. Reading Experience – It makes sure that your content looks great regardless of the device you use. Kudos option – You can add ‘kudos’ to the content that you liked. The kudos function works like the ‘like’ function of Facebook. Online forever – It promises to keep your published content online forever. Storage – It offers unlimited storage. Free trial – It offers a 2 week free trial to its new users. Pricing – It costs $6 a month. 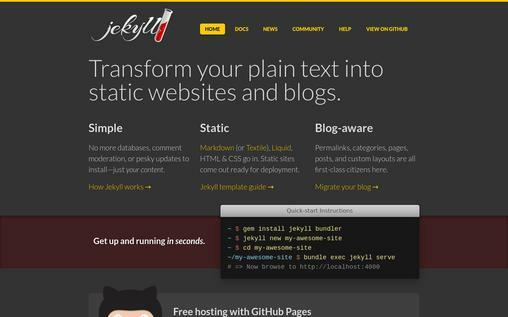 Jekyllrb is a simple static HTML websites and blogs generator with all the version controlled and content hosted on GitHub. It eliminates the complexity of other blogging platforms, you can easily create Jekyllrb powered website, host it on GitHub for free, add your name, social links, and avatars to customize it and publish your blog post. No CMS – Jefyllrb takes your raw content written in Markdown, run it through your templates and turns them into a static website which is ready to serve. No database – Unlike WordPress and other CMS (Content Management Software), it doesn’t have a database. All pages and posts are converted to static HTML which is great for loading speed as no database calls are made. Minimal – It doesn’t include any feature or functionality that is not used. Security – Jekyllrb has no database, CMS or PHP, so the vulnerabilities affecting platform like WordPress don’t exist which saves your time installing security updates. Convenient Hosting – If you already use GitHub, then GitHub will build and host your Jekyllrb website without any charge. 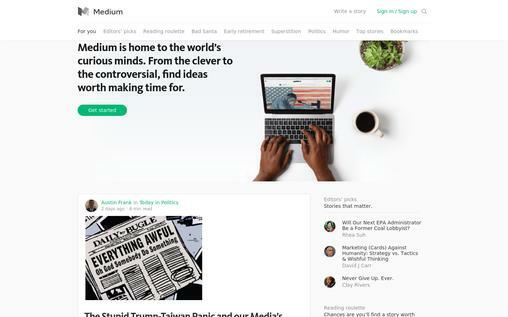 Medium is a free and open online publishing platform with very minimal, text-based blog editing pages built to reward quality content. It has an elegant design which is easy to setup and use. Here you can write, read and interact with the stories that matter most to you. The medium has a built-in audience where posts are curated and chosen for the homepage and the popular posts appear to the top automatically. World-class editor – The editor is simple and fun to use and the easy-to-use tools make sure that your content looks great. Also, it’s simple to integrate photo, video, and audio. Quality Content – It prioritizes quality over the date, so instead of showing the latest post on top, it shows the best content at the top. WYSIWYG Editor – You can compose an article in the WYSIWYG editor and it will look same like the final version seen by readers. Share Draft – It allows you to share the draft of your content with other users to get feedback on your work before publishing it. Analytics – It gives you full access to metrics which tell you how people are interacting with your content. Highlights – The posts are never static pages, you will find highlights from other writers. Squarespace is the most design-oriented publishing platform that offers a ton of design flexibility. It offers you beautiful mobile responsive template designs with flexible styling editor to help you make your site sophisticated. Modern Templates – The templates support all modern browsers and fit well on mobile devices. Style Editor – It allows you to customize the fonts, colors, and layouts of your content. Cloud Hosted Software – No need to install or upgrade. Social Integration – The powerful social integration allows you to import, sync and publish your content on various social media platforms. SEO – The templates include proper tagging, clean article links, valid XHTML code and XML sitemaps which are loved by search engines. Analytics – View the traffic and behavior of your readers in real-time. Know where your visitors are coming from and what keywords they searched for to find you. Customer Service – It offers 24/7 customer support with 4 hour email response turnaround time. 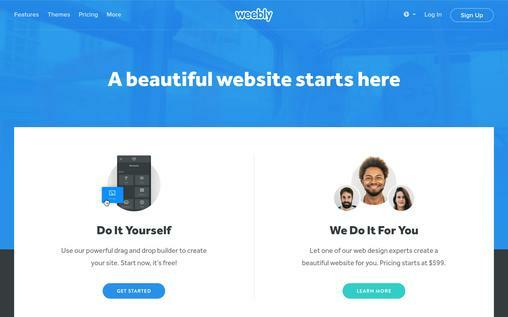 Weebly is one the easiest blogging software to build a simple yet elegant website yourself. It is extremely beginner friendly and allows you to start your blog in minutes. Weebly excels in design and provides many themes which you can customize with simple drag and drop tools. Simple Interface – The flexible and simple drag and drop interface allows you to build blog content quickly. Free Templates – The free blog templates are fully customizable and can work as both stand alone site or as part of a larger website. Powerful SEO – Create title tags, meta descriptions, and custom URLs, custom header to help your blog posts perform better in search results and bring more traffic to your pages. Advanced Tools – Get full control over post structure and layout of your blog. Also get the Facebook commenting system into your blog. Third Party Integration – If your blog is a video diary, literary review, photo journal or maybe all, then a range of integrations and media options are available in your dashboard or app center. Advanced sharing and scheduling – This feature allows you to schedule blog posts with scheduled sharing on Twitter and Facebook along with custom network messaging. Pricing – The pricing plan starts at $8/month. 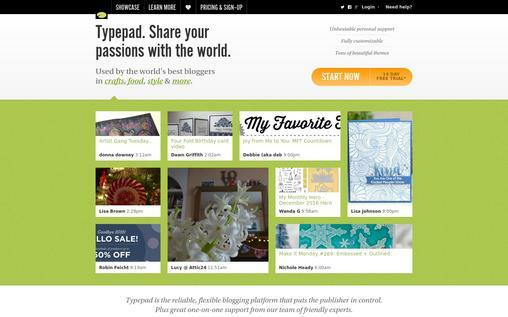 Typepad is a reliable and flexible blogging platform that gives you complete control site design, content, and ads. 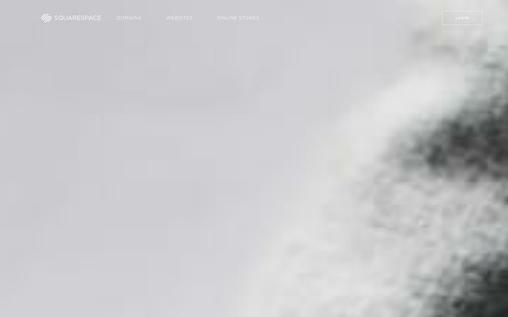 It is fully hosted and fully optimized for search and social discovery. You can choose from thousands of beautiful templates and layout options. 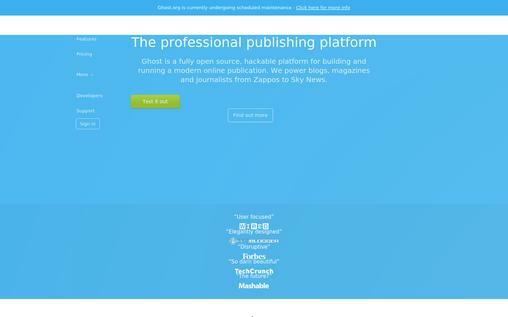 Easy Publishing – You can easily and quickly publish content from your computer, smartphone or even via email. Make Money – You can make money from your blog by running ads on your blog, selling your products and services, and joining the affiliate program of Typepad. Smart stats – Typepad easily integrates with Google Analytics and provides you with stats of your audience. Fully Customizable – Easily build your own design with the Theme Builder or you can design your own template. Professional Design – You can create an amazing and professional looking blog with the beautiful templates and the easy to use design tools. Free Trial – You can take a free trial of 14 days. Pricing – The pricing plan starts at $8.95 per month. 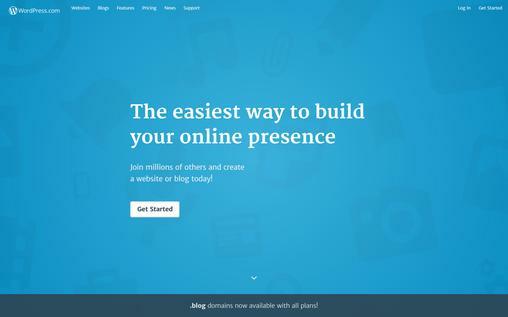 Blogger is an easy and free blogging platform of Google. It is one of the oldest and well-known providers and it is popular amongst the beginners. It allows you to easily login and publishes your posts for free with only a Gmail account. With Blogger you can create a unique and beautiful blog that fits your style. Perfect Design – You can design your blog yourself or select from a range of easy-to-use templates with hundreds of background images and flexible layouts. Free Domain – You can get a blogspot.com domain for free or buy a custom domain in just a few clicks. Earn Money – It allows you to get paid by displaying relevant targeted ads on your blog through Google Adsense. Built-in Analytics – The built-in analytics allows you to know your audience as you can see where your audience is coming from and what interested them. Also, you can get a more detailed look by connecting your blog directly to Google Analytics. Safe Storage – It allows you to safely store thousands of photos, posts and more with Google for free. is a free blogging platform that has attracted a lot of microbloggers who use their blog to showcase visuals such as photography, design, paintings and other forms of art. 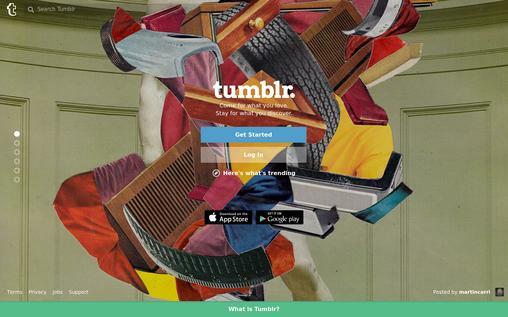 It lets you set up and manage a blog for free which Tumblr will host for you (if you keep ‘tumblr’ in the URL), making it a great choice for new bloggers. Re-blogging –The viewers of your posts can reblog your posts on their blog by adding a caption to it. Posts Supported – It supports seven types of posts which are text, audio, video, photo, quote, link and chat. Like Posts – Your viewers can leave likes on your posts like Facebook or Twitter. Schedule – You can either publish your posts immediately or schedule it for a later time and date. Google Analytics – Tumblr allows you to link your blog to Google Analytics to check the stats and behavior of your audience. If you are a novice or a hobby blogger and don’t want to invest any money than any of the free options are ideal for you. While the paid options are good for business blogs or professional bloggers who want to make it a career choice. So, choose the one that suits your needs and style. Happy blogging! It is a foremost task for any blogger to be on the top to feed their readers always. For the same, we have got an effective & affordable email marketing software service i.e. MailGet Bolt.